COLLEGE OF ART & DESIGN Home / Student Life / Why Louisiana? Known for its great people, its unique food and its lively music, Louisiana has something for everyone—especially artists and designers. But don’t take it from us! Hear it from the experts. The high ground above the Mississippi River—in a place the 17th-century French explorers called Red Stick—is an environment where landscape, climate, history, and culture allow for a lifestyle that is uniquely suited to the artistic temperament. Here, students develop their talents and refine their vision in a semi-tropical setting that provides fertile ground and unlimited material for an active imagination. 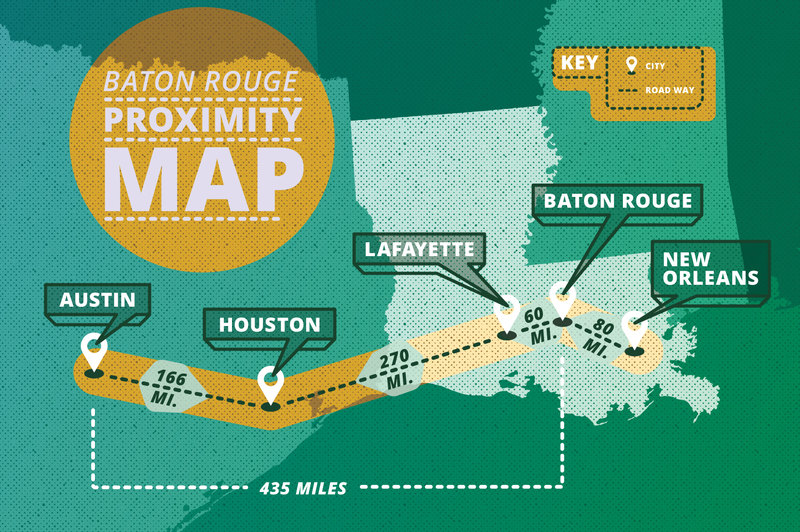 Baton Rouge represents the best of Louisiana’s vibrant culture, and is a fantastic jumping-off place for exploring the rest of the region. The Baton Rouge area has a semi-tropical climate that sets the scene for year-round outdoor sports and activities with mild and short winters, fabulous falls, and glorious springs. The physical setting of southern Louisiana and the lower Mississippi delta region provides an invaluable resource for practicing artists and the study of architecture and landscape architecture. Investigation of this shifting and fluid context results in the construction of frameworks useful for the the study of architectural and environmental issues that have both local and global import. Louisiana has arguably the most colorful history and fascinating culture of any state in the nation. In what other state could you visit the battleground where a ragtag group of soldiers repelled a British invasion with the help of a notorious outlaw pirate? Visitors can learn about many of the most interesting parts of general American history right here in Louisiana. From the National World War II Museum in New Orleans to the Sci-Port Discovery Center in Shreveport, and the countless museums, art galleries, zoos, and cultural and historical sites statewide, there is a lifetime of learning to do in Louisiana. Cultural opportunities include hundreds of festivals, including Mardi Gras, Cajun music and cooking, and an abundance of outdoor activities. Visit the official Tourism Site of Louisiana for all things Louisiana!